Counties are increasingly super red or super blue, with less and less in between. President Trump’s victory over Hillary Clinton was among the narrowest in history, and the country is deeply split on his job performance so far. But if you feel like you hardly know anyone who disagrees with you about Trump, you’re not alone: Chances are the election was a landslide in your backyard. More than 61 percent of voters cast ballots in counties that gave either Clinton or Trump at least 60 percent of the major-party vote last November. That’s up from 50 percent of voters who lived in such counties in 2012 and 39 percent in 1992 — an accelerating trend that confirms that America’s political fabric, geographically, is tearing apart. Of the nation’s 3,113 counties (or county equivalents), just 303 were decided by single-digit margins — less than 10 percent. 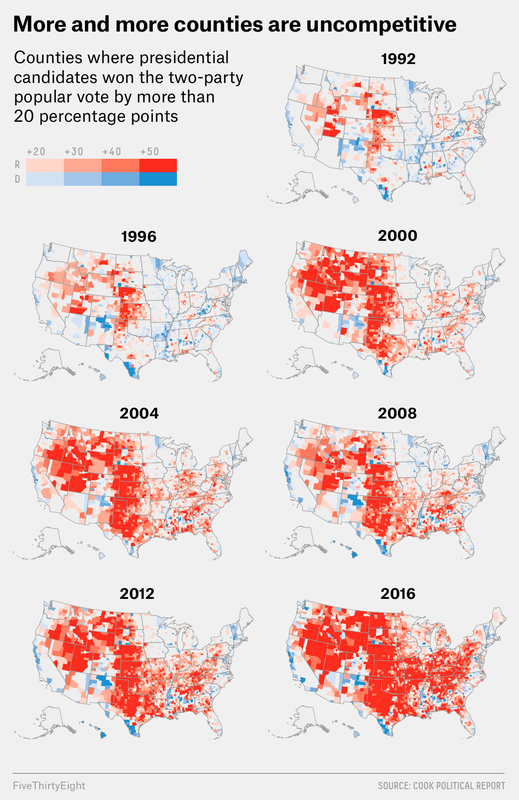 In contrast, 1,096 counties fit that description in 1992, even though that election featured a wider national spread.1 During the same period, the number of extreme landslide counties — those decided by margins exceeding 50 percentage points — exploded from 93 to 1,196, or over a third of the nation’s counties. The electorate’s move toward single-party geographic enclaves has been particularly pronounced at the extremes. 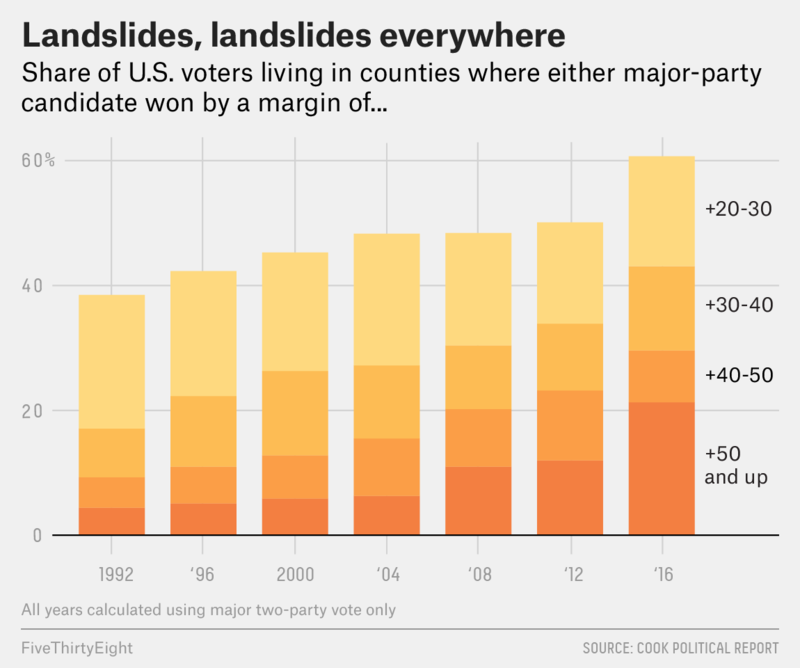 Between 1992 and 2016, the share of voters living in extreme landslide counties quintupled from 4 percent to 21 percent. November’s election was an exclamation point — or perhaps a flashing danger sign. Legions of big counties were won in a landslide (by at least 20 points): The counties containing Ocala, Florida; St. Cloud, Minnesota; Utica, New York; Wilkes-Barre, Pennsylvania; and Charleston, West Virginia, were Republican routs for the first time in a generation. Meanwhile, San Diego County, California; Montgomery County, Pennsylvania; and Henrico County, Virginia — all GOP landslide counties in 1988 — became Democratic landslide counties in 2016. Those examples prove that communities can change allegiances over time. But most places just aren’t budging — in fact, they’re doubling down. In an increasing number of communities like Baldwin County, Alabama, which gave Trump 80 percent of its major-party votes, and San Mateo, California, which gave Clinton 80 percent, an entire generation of youth will grow up without much exposure to alternative political points of view. If you think our political climate is toxic now, think for a moment about how nasty politics could be 20 or 30 years from now. Bill Clinton defeated George H.W. Bush by 6 percentage points in 1992; Hillary Clinton beat Trump in the popular vote by 2 points.